Although Alex didn’t know me, I knew him or of him I should say. He’s originally from Cheshire, England and now makes his home in Pennsylvania. He’s worked in racing for 20 years, and covered the Triple Crown for The New York Times. His website is an incredible hub for horse lovers, with Alex’s insightful writings, a discussion board, racing news, and great links. Alex’s website is also the home of Fans of Barbaro (FOB), which has raised more than $1.4 million and saved more than 3700 horses. He’s now offered to raise a little more, and help save a few more horses, by offering to donate 10% from the sale of each book to my favorite Thoroughbred rescue organizations — ReRun and CANTER — when you place your order through alexbrownracing.com and mention my blog (reflectionsonriding.wordpress.com). He’s signing every book, too. ROR [reflectionsonriding]: What was it that made you decide to write this book and what makes it the perfect holiday gift? 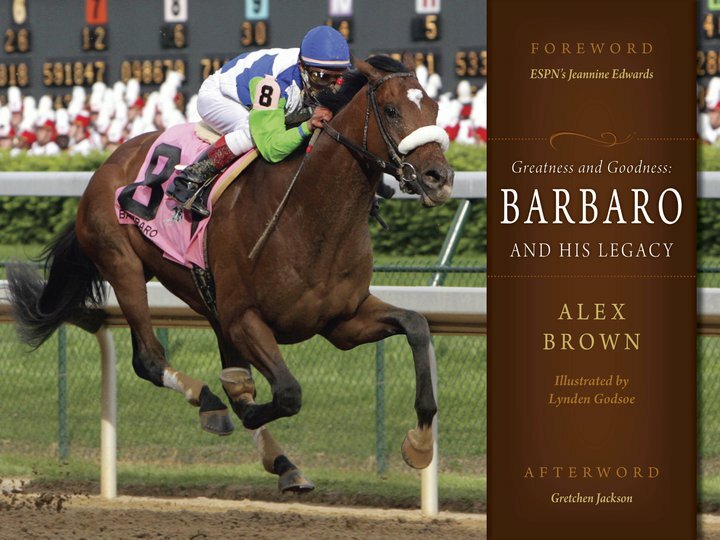 Alex: I was fortunate to know Barbaro and all those who were connected to that great horse. I was in a unique position to write this book, although I can assure you I won’t be writing another! I think the book should appeal to any animal lover, as Barbaro was, after all, simply a very inspirational animal. The feedback from the book, thus far, suggests that it has much broader appeal than one might first imagine. ROR: So few of us were there to see Barbaro after his injury. I know you were able to see him from time to time. Can you tell us how he coped with the extraordinary efforts to keep him alive? Alex: He coped very well. It’s amazing to think that one moment he is on top of the world running for fun, and then the injury occurred and he was stall bound immediately. He handled the new situation with the class that he possessed. I visited him on a number of occasions towards the end of his time at New Bolton Center, and I always saw a horse that simply wanted to live and move on to the next phase of his life. And he so nearly did make it out of there. ROR: If there is one lesson to be learned from Barbaro, what would you say that is? Alex: Never give up. While the outcome was not good, the effort was first class, from the horse, the surgeon, his team and everyone else involved. Barbaro taught us we should never give up. ROR: Alex, how many thoroughbreds do you think you’ve handled in your career? What do you think of the reputation they have for being “crazy” or temperamental? Alex: Hah! Can I just say a lot?!! When I was traveling and working for Steve Asumussen, I would ride about 2500 times a year. Obviously, that’s not 2500 different horses, but it is quite a few. And I have been riding all my life and I am getting old. So I have handled many, many Thoroughbreds. I think their [negative] reputation is undeserved. The majority of horses I have ridden have been very laid back and relaxed while doing their exercise. Personally, I think the Thoroughbred is very willing, intelligent and athletic. Some are just slower than others, and for our sport [racing], that is not a good thing. ROR: Are you seeing changes in the racing industry in terms of the slaughter pipeline for racehorses who have stopped earning? Alex: Yes, we as an industry are becoming much more aware of what needs to be done with our stars, once they have finished running. That being said, we have a long way to go, and we have some “bad actors” in our sport that sully the reputation of all horsemen. I do think our sport needs to do a better job of removing those people by refusing them licenses. I was at a kill auction in Shipshewana, Indiana, and the main buyer there is a licensed racehorse trainer in Michigan. I just don’t think that’s right. ROR: I couldn’t agree more. Would you tell us a little bit about your efforts to find homes for OTTBs [off-the-track Thoroughbreds] and the resources available on your website? Alex: My website is basically a broad community, where lots of people gather and network to find new homes for horses. My role is mostly just to keep the site going (and now, to try to sell my book), it’s the community that is making the difference. It’s cool to see horses getting re-homed, and see that people are starting to take another look at Thoroughbreds as potential dressage horses. They’ve always made great event horses, but recently, I came across a horse who had been slow at Penn National and later competed successfully at Burghley and Rolex [Shiraz, ridden by Colleen Rutledge]. It’s a great example of a horse finding its right sport, in order to excel. Now I’m hoping he can represent the US in the Olympics. That would be super cool! ROR: When you and I first met, we talked about the decline of the Thoroughbred in eventing, with the elimination of roads and tracks and steeplechase. Do you share my distress about the short format? Alex: Yes. I was not aware that these elements were no longer a part of major three day events. Obviously, if you remove an aspect of an event where a certain type of horse excels, it’s going to favor other types of horses. A horse is a horse, and I love them all, but no doubt I would prefer Thoroughbreds have a better opportunity to excel in their second careers. ROR: I grew up riding Thoroughbreds off the track, right after I outgrew ponies, so I know they’re more versatile than a lot of people think. You gallop racehorses for a living (in addition to being an author). What insights do you have for those of us schooling ex-racers for new careers? Alex: Enjoy! They are intelligent, willing and athletic. Don’t be intimated by the reputation. Great advice from Alex. And a great book to read and to give this holiday season. Here’s how to order your copy (use the link below the “Buy Now” button to email Alex for a personalized signing and don’t forget to mention reflectionsonriding.wordpress.com). My thanks go out to Alex for sharing his thoughts with us, for writing a wonderful book, for extending his heartwarming offer, and for all his gifts to the horse world. Hmm, might be a book to put on the wish list. In hindsight, I’ll always wonder if Barbaro could have been saved if his diet was changed and if the vets had tried a barefoot trim while he was recuperating from the original injury. We’ll never know. Who don’t you know, Katie? I just like to get to know people who are passionate about horses, that’s all.